5* HOLIDAY LODGE WITH YOUR OWN PRIVATE HOT TUB SLEEPS 6 PEOPLE.Situated at Finlake holiday park set in 130 acres of countryside. facilities include 2 new indoor/outdoor swimming pools,spa,gym,2 fishing lakes,horse riding,tenis,internet,restraunt/bar. 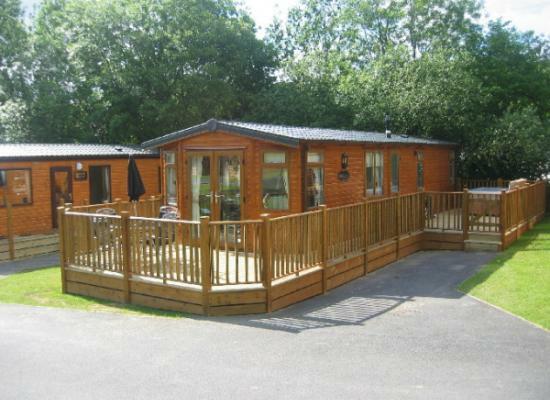 Located within the beautiful countryside setting of Devon, between the coast and Dartmoor National Park, is the 5 star Finlake Holiday Park in Chudleigh. Situated amongst woodland and open countryside it is a great place for enjoying the outdoors and all the activities provided by the site. You can of course wander through the woods or explore a cycle route with your family to enjoy the peace, quiet and scenic nature of this location. A holiday at Finlake Holiday Park gives you the opportunity to simply sit back and relax or keep busy with the many things to do on-site and within the local area. On-site at the Finlake Holiday Park there is a heated indoor pool and outdoor pool, gymnasium, spa, restaurant and bar, fishing lake, 9 hole golf course and daily activities for the kids. In the area close to Finlake Holiday Park there are numerous places to visit during your caravan holiday. Some of the nearby towns and cities include Paignton, Torquay, Dawlish, Teignmouth, Dartmouth and Exeter. For attractions to visit in the area you have Pennywell Farm, The Butterfly Farm, River Dart Country Park, Becky Falls plus countless walks and cycling routes.